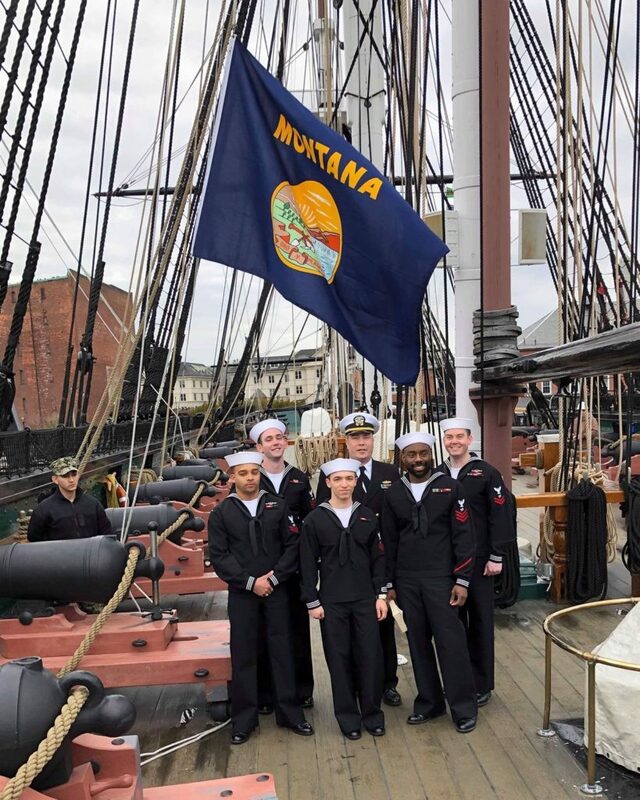 Members of the MONTANA crew recently took part in a special re-enlistment ceremony in honor of Electronics Technician (Nuclear) Second Class Victor Karstendiek onboard the USS CONSTITUTION in Charlestown, Massachusetts. Petty Officer Karstendiek had the privilege of selecting his re-enlistment site as the CONSTITUTION for both its proud history and legacy. As the world’s oldest commissioned vessel still afloat and undefeated in battle, the CONSTITUTION proudly reflects the fighting spirit of the Navy. In the picture you can see the Montana flag hoisted on the CONSTITUTION along with Petty Officer Karstendiek, LT Dan Noble (the re-enlisting officer), and several members of the MONTANA crew.